MONDAY (Labor Day) we will ring in the holiday with a Hero WOD with two classes at 10AM and 11AM only. THESE WILL BE THE ONLY CLASSES TOMORROW! Following the 11AM workout, feel free to bring some post-WOD “pot luck” drinks or snacks and hang around. If you can’t stick around after (boo!) just come on in for a great WOD and get in a good sweat. Please note we will have sitter coverage for the 10am class only. As you know, spots were limited and we only have ONE spot left! Of course children are MORE than welcome to come to the 11a and potluck BBQ, but must be under adult supervision. There will be NO 6-Week Challenge class that Monday night, but EVERYONE from the Challenge is welcome to come! We will have a special 7:30p Tuesday class for any guys from the Challenge who can’t make it on Monday. 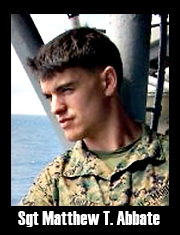 Monday’s workout will be a Hero WOD in honor of U.S. Marine Corps Sergeant Matthew T. Abbate. Abbate, 26, of Honolulu, Hawaii, assigned to the 3rd Battalion, 5th Marine Regiment, 1st Marine Division, I Marine Expeditionary Force, based out of Camp Pendleton, California, was killed on December 2, 2010, while conducting combat operations in Helmand province, Afghanistan. He is survived by his wife Stacie Rigall, son Carson, mother Karen Binion, father Salvatore Abbate, and siblings Dominica Abbate, Elliot Abbate, Valerie Binion, and Kelly Binion. We will have PLENTY of scaling options so please come out and honor this incredible soldier and bond with our amazing community! Here’s a throwback pick from last year’s Labor Day warm up for “Abbate”!